The forecasts are gradually steadying for the storm surge flood elevations for Sandy, but strong uncertainty exists because the timing of the flood relative to high tide can make all the difference … The “central forecast” for the storm is for it make landfall as an extra-tropical storm similar to a very large Category 1 hurricane with maximum winds of about 70-80 mph, and run a northwestward course across the center of New Jersey’s coast. This storm track is more-or-less a worst-case scenario for NYC flooding. Below I will briefly summarize what our storm surge forecasts say we can expect, as well as what we see as the worst-case scenario for flood elevations. Bur first, in plain English: Coastal flooding for coastal areas within roughly 100 miles north and east of the storm will most likely be severe and damaging, roughly similar to Irene’s flood and going over seawalls and over beaches that lack protective dunes. And at the more extreme end, with lower probability, flood levels could be about 6 feet above area seawalls and even surpass coastal dunes, causing even more severe destruction and extending far inland into low-lying areas. Some flooding could come as early as Monday morning, but the worst is expected Monday evening. Another wave of flooding may come with Tuesday morning’s high tide. Our NYHOPS/SSWS system’s forecast is in general agreement within a foot or two of the forecasts of NOAA’s ET-Surge (shown in plots below) and Stony Brook’s surge model, so models are coming into much better agreement. This storm will be very large, and strong onshore winds of over 40 mph will likely extend hundreds of miles off toward “the right of the storm” as its center makes landfall. This suggests widespread flood impacts, not only localized impacts near the center of the storm. 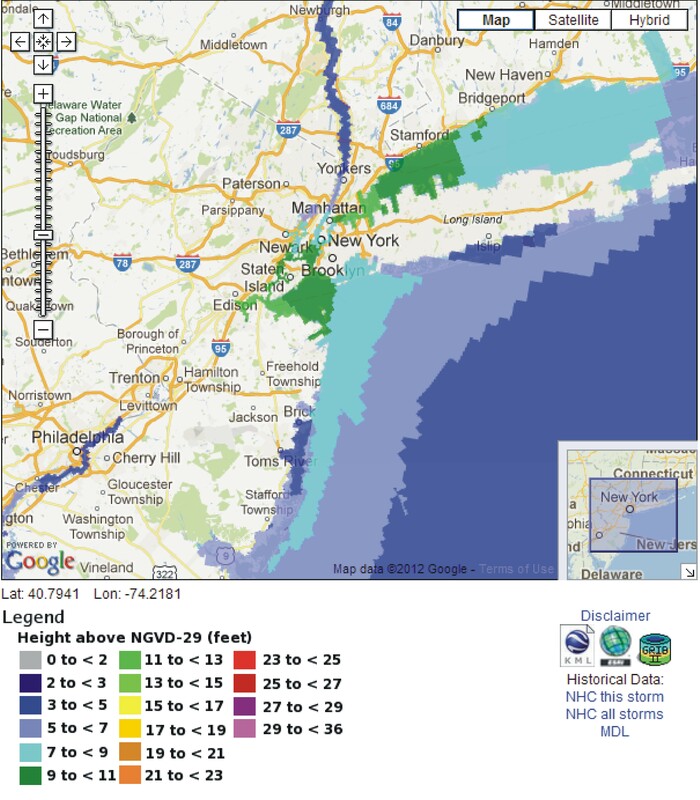 The NYHOPS Storm Surge Warning System forecast for the NY/NJ Harbor and New York City region is for Sandy’s coastal flood height to be similar to or a few feet higher than Irene, which itself flooded into the city’s low-lying neighborhoods. (However, if you prefer REALLY scary stories, take heed of the 10% likelihood flood forecast I describe further below, if you want to know what is a sort-of a “worst-case scenario”). Stevens NYHOPS Storm Surge Warning System forecast for water levels at The Battery (magenta), relative to mean lower low water (MLLW – normal daily low tide). Predicted tides are also shown (blue), as well as observed water levels and the NOAA ET-Surge forecast for comparison (green). 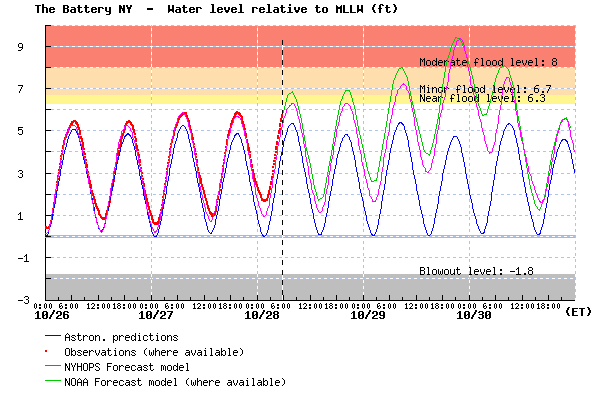 Above is a figure showing the NYHOPS and NOAA forecasts for Battery Park — the New York/ New Jersey Harbor region – 9.4 ft above MLLW (typical low tide level), 6.7 ft above local mean sea level (near NAVD88). This is about 1-2 ft above some low seawalls around the city; about the same as Irene’s flood level. 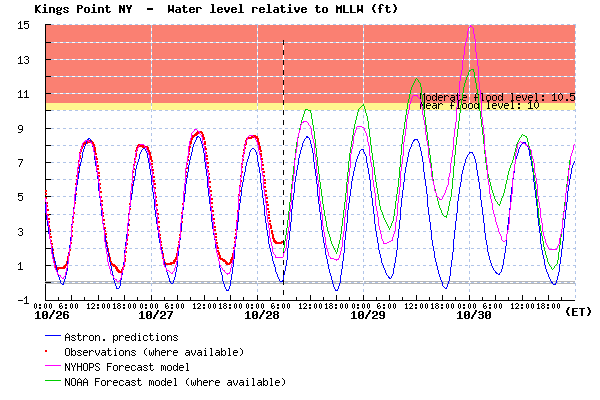 Stevens NYHOPS Storm Surge Warning System forecast for water levels at Kings Point in Western Long Island Sound (magenta), relative to mean lower low water (MLLW – normal daily low tide). Predicted tides are also shown (blue), as well as observed water levels and the NOAA ET-Surge forecast for comparison (green). Above is the forecast for Kings Point and other areas in Western Long Island Sound and the eastern end of East River (e.g. Flushing) – 15.0 ft MLLW, ~11 ft above local mean sea level; this is roughly 3 ft ABOVE Irene’s flood elevations. However, one should take heed of the NOAA P-SURGE 10% likelihood exceedance storm surge forecast, which is sort of like a mild version of a worst-case scenario forecast. That currently shows there is a reasonable possibility for Sandy to be about 4-5 feet higher than these forecasts. NOAA’s probabilistic surge (P-Surge) forecast of a 10% likelihood storm surge amplitude. To estimate total water levels, add this value to the tide height at the time of peak surge. For a good estimate of a “worst-case scenario” total water elevation, add this to the high tide elevation, but subtract 1 ft because they use an old height datum (NGVD29) and that is close to a foot below mean sea level. In this case you get a total of about 14 ft above MLLW (typical low tide) for The Battery, or 17 ft for Kings Point, both shattering existing records and sending water 5-6 ft above seawalls and into the city’s low-lying neighborhoods. This could happen if the storm winds up making landfall with stronger peak winds than are currently predicted, perhaps as a strong Cat-1 hurricane with peak winds from 80-90 mph. These would be by far the highest flood elevations in the 80 years that records have been kept, and unless efforts are taken to protect vulnerable infrastructure, this would definitely cause some subways, highway tunnels, and electrical infrastructure to be filled with salt water and shut down for weeks. The Stevens NYHOPS Storm Surge Warning System is re-run with the latest weather forecast every six hours, so visit again to check for updates, and STAY DRY! This entry was posted in water, weather and tagged forecast, Frankenstorm, gale, harbor, hurricane, long island, Long Island Sound, new jersey, New York City, predicted, Sandy, storm surge, storm tide, tide, total water elevation, wind. Bookmark the permalink.